Over the weekend a paparazzi photo of David and Victoria Beckham started circulating around the internet—and the “Outfit Inspo” Slack channel at SG HQ. The well-heeled couple was snapped in New York City, and while Posh Spice obviously looks great, as always, we’re gathered here today to talk about our boy David’s perfectly laid-back ’fit. Over the former soccer player (sorry, footballer)’s light-wash jeans, white T-shirt and boots, he ever-so-casually threw on a long navy overcoat. Over a hoodie! And he looked amazing! 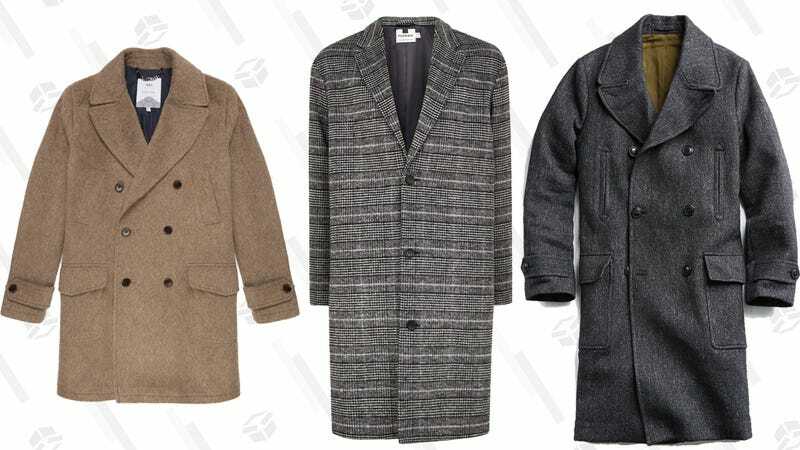 It got all of us thinking about just how versatile a really nice wool coat can be. Why? Because it elevates everything else you wear with it (even a plain white tee and grey hoodie!). A topcoat in a neutral color—think grey, navy, camel or black—can really do it all, which means investing in one will set you up for work days, nights out, and hangover brunches all at once. Now, seeing as it’s already February, it’s time to make moves. A lot of retailers have sold through most of their winter outerwear sizing already—but don’t despair! Below are seven options at a variety of prices that are still available in most sizes. You can thank me later because spoiler alert, there are still like 45 more months of winter left. If you’ve got the essentials covered, consider adding this fun (and affordable!) checked coat from Topman to your rotation. Not to get too prescriptive, but it would look especially good over a grey crewneck sweatshirt and black jeans on the weekends, and serve as the last layer over your cashmere sweater and chinos for a date night. This is a double-breasted option found while digging through the virtual clearance bins for you, and a major sale score. This casual mohair coat looks slightly fuzzy, and therefore extremely cozy. It’s the ideal “going out” coat to us, because the big exterior pockets are perfect for storing your beanie and gloves when you hang it up at the bar. Plus, the relatively lower price point means you won’t have a complete meltdown if someone dribbles a little beer on it while you’re out. The subtle pattern of this Rodd & Gunn topcoat makes it stand out from the sea of grey wool you’ve seen out on the streets this winter. It will look just as bossy over a suit for work and formal outings, as it will over a henley and joggers for a weekend coffee run. We don’t toss this word around lightly when it comes to menswear at SG HQ, so know that I mean it when I say that everything Suitsupply does is elegant. This dark grey, 100 percent wool overcoat feels a bit dressier than some of the other options here, so it’ll look best over your favorite sport coats and suits this winter. Military-inspired outerwear is one of those “make the ladies swoon” style moves. Blame Top Gun, if you must. This officer coat from Todd Snyder is no exception, and it’s majorly on sale. (Heh.) Going the double-breasted route might feel a little unfamiliar, but trust me; you can pull off this look, and you really should. Button this guy up over your fisherman sweater and a denim jacket for the ultimate layered winter ensemble. Don’t be surprised if you find yourself fashion-crushing hard on Mr Porter’s in-house brand Mr P. Their take on modern menswear essentials is just so spot-on, and more often than not, surprisingly affordable (y’know, for Mr Porter). A camel overcoat like this qualifies as a classic, so you should feel confident when investing and taking time to make sure it’s the right one. Mr P.’s version is made from virgin wool and camel hair, which explains the price tag—but you’ll have it forever and wear it with everything, so we support the splurge. And finally, a unique, splurge-worthy coat that’s like “the young Robert Redford” of topcoats—yes, it’s that good-looking. Brooks Brothers has a huge array of sophisticated outerwear in the usual neutrals, but this one stands out for its brown herringbone texture that’s detailed without being fussy. Don’t get me wrong, you can still wear this bad boy (in a luxe blend of alpaca, wool, mohair and silk) with pretty much anything in your closet—but don’t be surprised if you get stopped on the street ’cause you look so damn fly.